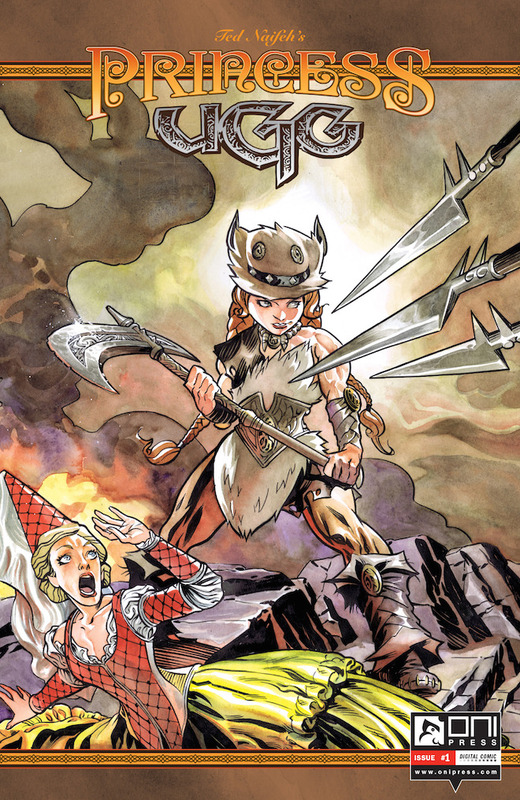 I previously ignored the new Oni title Princess Ugg because I thought it was some kind of fantasy story, what with the barbarian princess with the battleaxe on the cover. (Author Ted Naifeh is best known for the Courtney Crumrin series.) I was wrong. 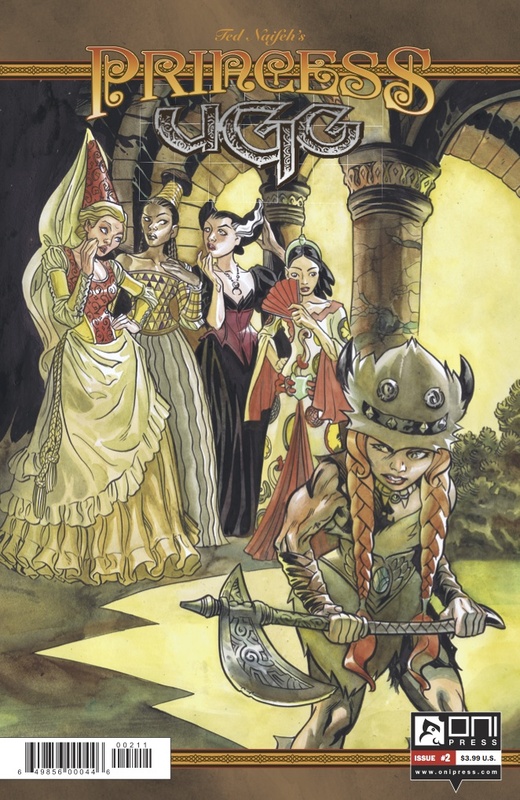 It’s set in a fantasy-style kingdom, but it’s really a social satire, a fresh take on what it really means to be a princess. Ülga is princess of Grimmeria, a cold and forbidden mountain land where strength is valued. She’s being sent off for schooling to a lowlands school for royalty. There she meets other princesses, the more typical kind, raised in luxury. The contrast is hilarious. Of course, she ends up rooming with the fussiest of them all, Julifer, who hates her from the moment they meet. Naifeh’s art is as impressive as always. The settings are amazing, giving the impression of a fully thought-out world. The young women are expressive and moody, as they need to be to sell the comedy. I particularly like Ülga’s ride to school, a wooly mammoth named Snorri. There are hints that there will even be a moral, with mentions of looking for “true worth”. The second issue, sent out as an advanced digital preview, explores more of the Academy. The first issue deals with Ülga’s arrival; the second puts the girls into direct, long-term contact. There, Ülga struggles with their definitions of proper meals and fashion and behavior. That’s some classic “fish out of water” comedy, but the new girl isn’t just made fun of; she’s also due sympathy, as many readers will identify with feeling like they don’t fit in. This is a portrait of different ways of living and different talents valued. She’s bored by their lives, leaving the reader to wonder why she’s so set on being there in the first place. That’s promised to be covered in an upcoming issue, based on the last page of this one. Retailers can adjust orders on this title through June 23, so if you’re curious, let your comic shop know you want to see issue #2 when it’s due on July 16.